Some days, I’m in the mood for a little Chinese food. The sweetness, the spiciness… it’s a beautifully tasty thing. But, sometimes Chinese take-out can have a lot of sugar. I mean, I don’t want to hate on the restaurants, but sometimes those sweet recipes are a bit like candy. So, I had to fix. 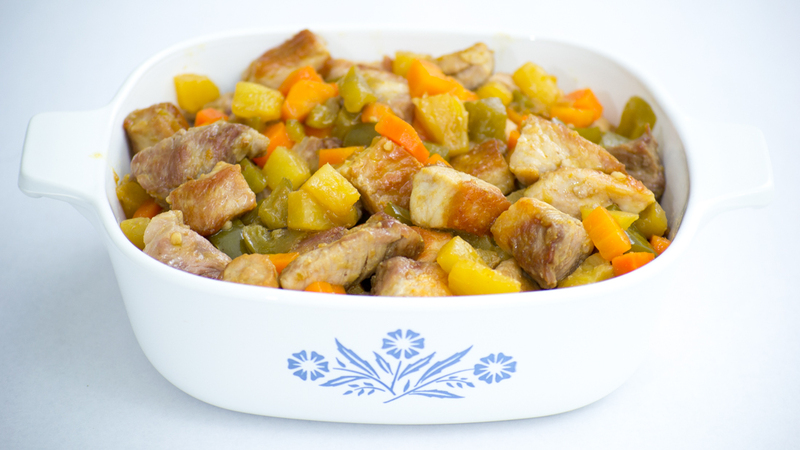 And I took my mom’s Sweet and Sour Pork recipe and redid it without all the added sugar. So tonight, it’s sweet and sour pork night. Score! There is no added sugar to this, and the only sweetness you get is from the pineapple and carrots. So, if you find you would like it a bit sweeter, I suggest additional pineapple. That said, so far the reviews on the sweetness as written were positive. Step 1: Combine the diced pepper, carrots and pineapple together in a bowl with a sprinkle of salt. Let sit for about 15 minutes to pull some of the juices out. Step 2: In the first pot, over medium heat, melt 1 tbsp coconut oil. Add garlic and cook for a minute or two until the garlic starts to brown slightly. 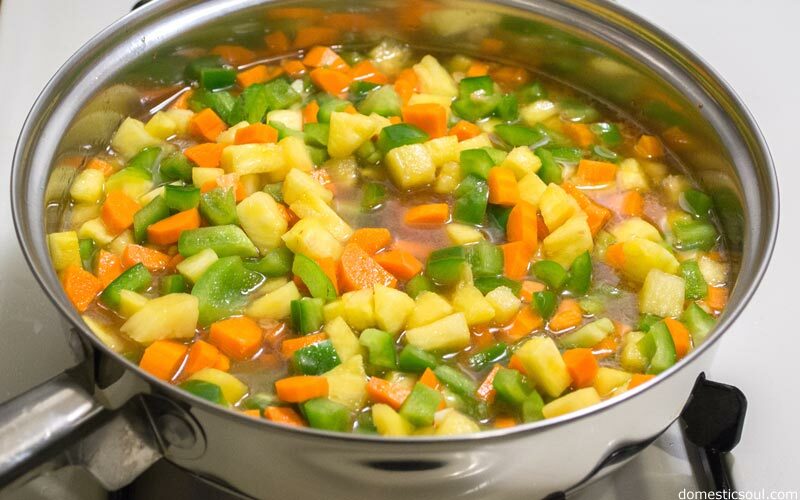 Step 3: Add the pepper, carrots, pineapple, vinegar, broth, Gluten Free Tamari Soy Sauce – OR –coconut aminos. Cover and simmer over medium heat for about 30 minutes. Step 4: Cut pork roast up into cubes and sprinkle on a little salt. 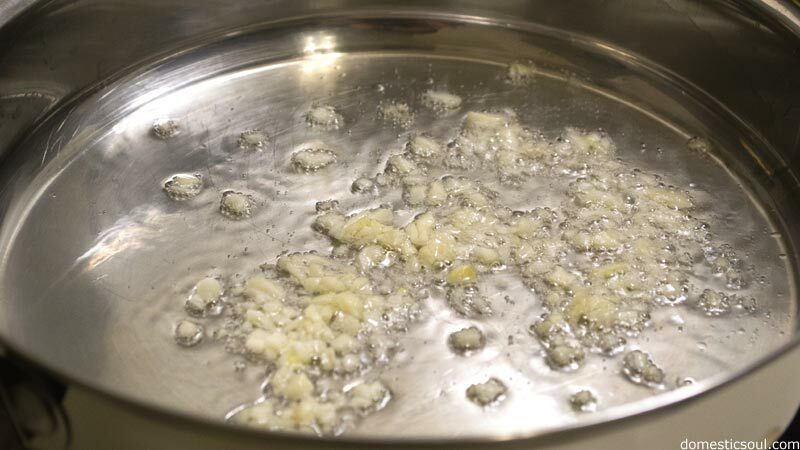 In a second pan, melt 2 tbsp coconut oil over medium high heat. Cook pork in batches until cooked through and most pieces have a nice sear. 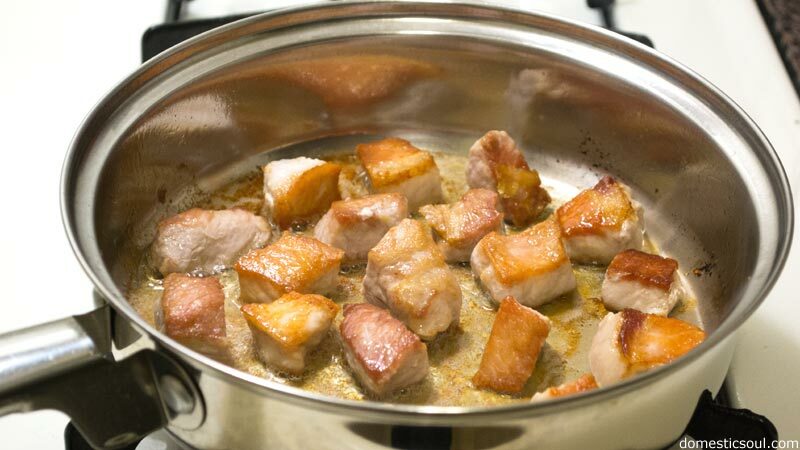 Remove cooked pork from pan and place in a large bowl. Step 5: Remove lid from sauce pan and continue to simmer until most of the liquid has boiled off. You want the sauce to become vegetables with a little extra liquid. Step 6: Add the sauce to the large bowl and toss with pork pieces. Step 7: Serve by itself or over lacto-fermented rice for a delicious meal. 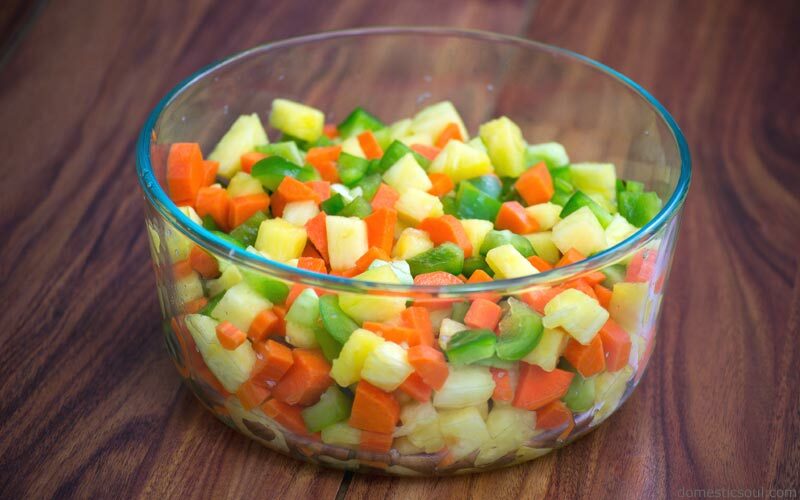 Combine the diced pepper, carrots and pineapple together in a bowl with a sprinkle of salt. Let sit for about 15 minutes to pull some of the juices out. In the first pot, over medium heat, melt 1 tbsp coconut oil. Add garlic and cook for a minute or two until the garlic starts to brown slightly. Add the pepper, carrots, pineapple, vinegar, broth, Gluten Free Tamari Soy Sauce – OR –coconut aminos (if you are avoiding soy). Cover and simmer over medium heat for about 30 minutes. Cut pork roast up into cubes and sprinkle on a little salt. In a second pan, melt 2 tbsp coconut oil over medium high heat. Cook pork in batches until cooked through and most pieces have a nice sear. 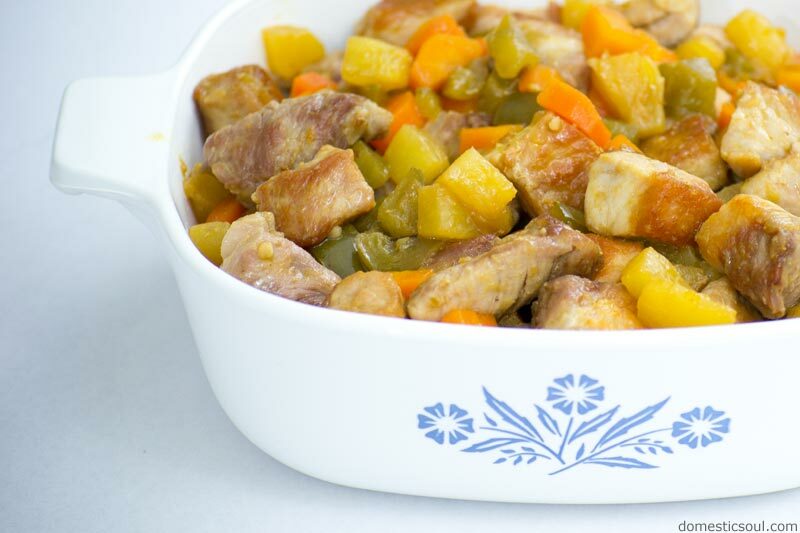 Remove cooked pork from pan and place in a large bowl. 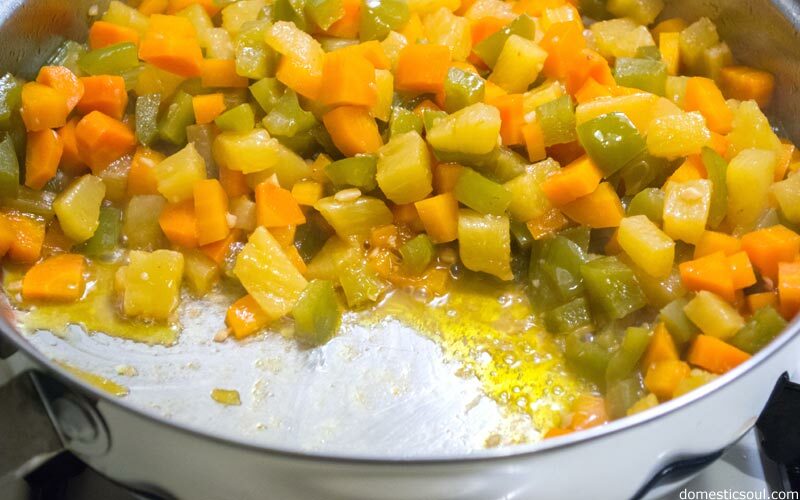 Remove lid from sauce pan and continue to simmer until most of the liquid has boiled off. You want the sauce to become vegetables with a little extra liquid. Add the sauce to the large bowl and toss with pork pieces. Serve by itself or over lacto-fermented rice for a delicious meal. Previous articleGrain Free Jambalaya Recipe – No rice!